Take 20+ year-old, high-mileage Electro-Motive SD60s, put them in the able hands of the master-builders of Norfolk Southern’s fabled Juniata (Altoona), Pa., shops – and the result is a fleet of rebuilt, “better than new” diesels: NS’s unique SD60E. And now, the distinctive Norfolk Southern SD60E is ready for Train Simulator service! Back in 2010, Norfolk Southern rostered an aging fleet of standard-design EMD SD60s which had been received from Electro-Motive between 1985 and 1990. For many railroads, the choice might have been to retire and sell the decades-old diesels, but with the skilled designers and workforce of its Juniata Shops (once of Pennsylvania Railroad fame), the railroad instead chose to rebuild the husky six-axle diesels. And, between 2010 and 2017, NS rolled out examples of its enhanced SD60s... designated SD60E. To the trackside observer, the difference between a standard (“Spartan cab” equipped) SD60 and a remanufactured SD60E is striking to see, as a key feature of the SD60E rebuild program was application of a new wide-nose cab design dubbed the “Crescent Cab” by the railroad. In addition to providing the crew an enhanced work environment, the Crescent Cab, built by Curry Rail Services just down the road from Altoona in Hollidaysburg, Pa., meets updated FRA crashworthiness standards. 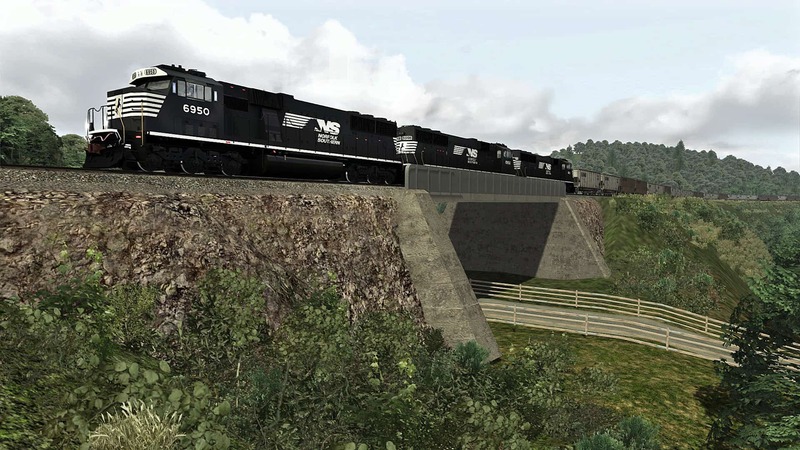 But, to borrow the oft-turned phase, when it comes to the Norfolk Southern SD60E, there is “more than meets the eye.” Powered by an EMD 16-cylinder 710G3B engine and equipped with EM2000 microprocessors, the SD60E is rated at 4,000 horsepower (versus 3,800-horsepower for a standard SD60). Electronic fuel injection, NS’s split cooling system, electronic air braking systems, positive train control capability, and compliance to Tier 0+ emissions standards are additional features of the SD60E. Indeed, it is estimated that the SD60E delivers a seven percent improvement in fuel efficiency as compared to the performance of a standard SD60. Norfolk Southern’s SD60E program at Juniata churned out 136 rebuilds (NS road number block 6900-7035) and the program has included not only original NS units, but second-hand SD60s purchased by the railroad (with heritages of Union Pacific and Chicago & North Western service). The majority of the SD60Es are dressed in NS’s striking “Thoroughbred” livery, but three SD60Es have been outfitted in special liveries (NS No. 9-1-1 honoring first responders; NS 6920 honoring service veterans; and NS 6963 in a special “Go Rail” livery). With Norfolk Southern’s motive power philosophy increasingly focused on A.C. power and a 4,400-horsepower road power standard, it is uncertain if additional SD60Es will be remanufactured, but the distinctive and potent SD60Es, which can be found system wide lugging everything from heavy coal tonnage to intermodal traffic, will be members of the NS diesel fleet for years to come. 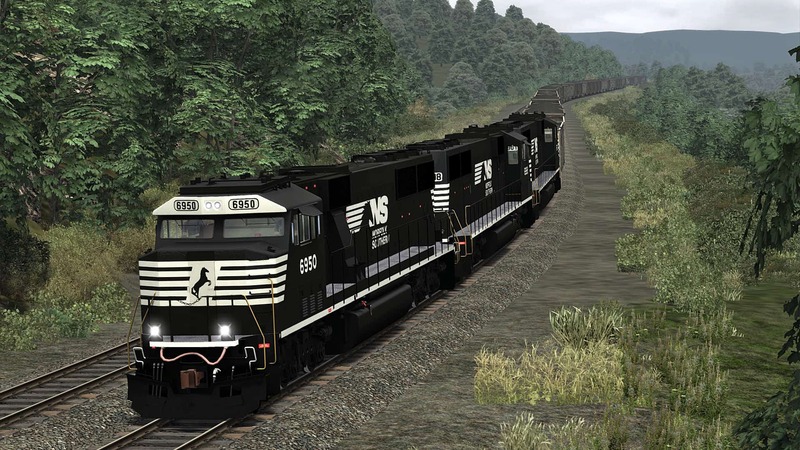 Developed by The LocoShop, the now available Norfolk Southern SD60E for Train Simulator features an authentic “Crescent Cab” with a variety of realistic control and operating features. 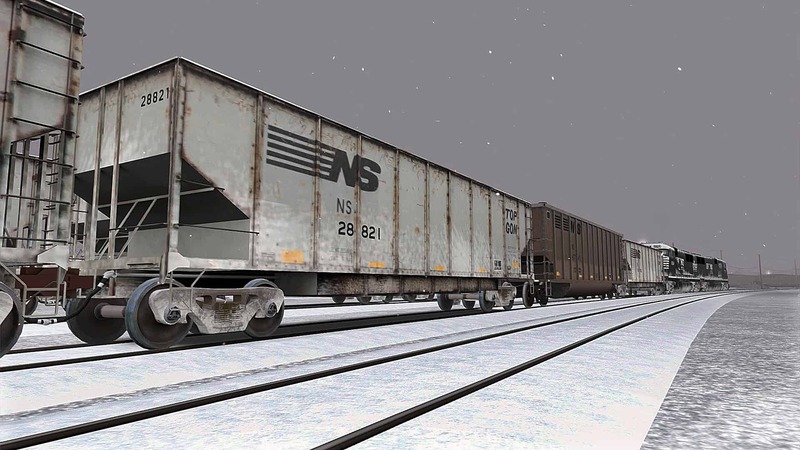 The Train Simulator NS SD60E is outfitted in the railroad’s “Thoroughbred” livery and is provided in both clean and snow-dressed livery variants. 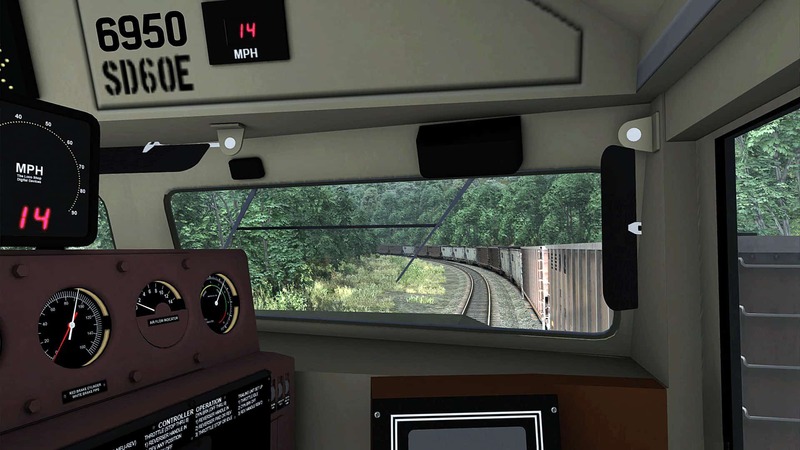 As a bonus that Norfolk Southern enthusiasts are sure to love, the SD60E pack also includes Norfolk Southern’s noted “Top Gon” rebuilt coal gondola, several thousand of which were rebuilt by the railroad from older hoppers beginning in 1991 and which will be ideal for coal duty on many Train Simulator routes. 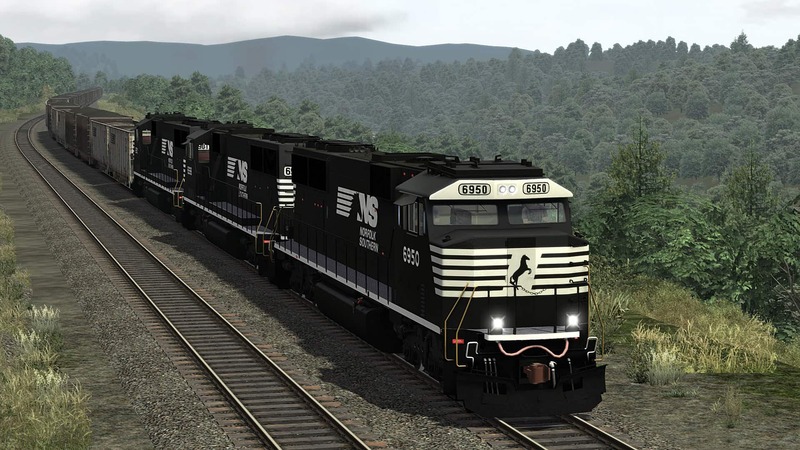 Four scenarios featuring the NS SD60E and Top Gon cars in service on the Norfolk Southern Coal District route (route available separately) will be provided with the pack. 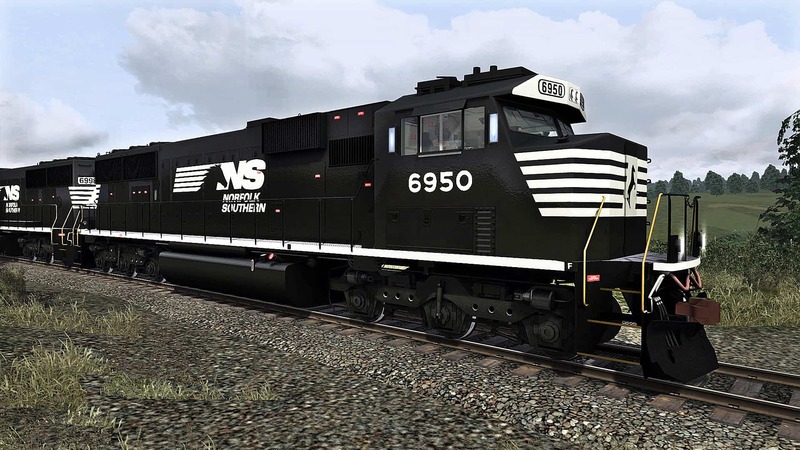 The unique Norfolk Southern SD60E is now ready for Train Simulator service! Beginning in 2010, the Norfolk Southern conducted a program at its famed Juniata (Altoona), Pa., shops to upgrade its fleet of standard Electro-Motive SD60 locomotives and the results, through 2017, were 136 enhanced-performance diesels. Screenshots by Gary Dolzall. Norfolk Southern SD60Es prepare to load coal at Bailey Mine (above) on the NS Coal District route, then begin the eastward journey over the rugged Manor Branch (below). Powered by an EMD 16-cylinder 710G3B engine and equipped with EM2000 microprocessors, the SD60E is rated at 4,000 horsepower. Electronic fuel injection, NS’s split cooling system, electronic air braking systems, positive train control capability, and improved fuel efficiency are features of the SD60E. Note: Screenshots depict content still in development. Whether from trackside (above) or the engineer’s seat (below), the most distinctive visual feature of the remanufactured SD60E is its “Crescent Cab.” In addition to providing the crew an enhanced work environment, the Crescent Cab design, built by Curry Rail Services, meets updated FRA crashworthiness standards. Working eastbound over the rugged and remote Manor Branch, Norfolk Southern SD60E 6950 and sisters have heavy coal tonnage in tow. 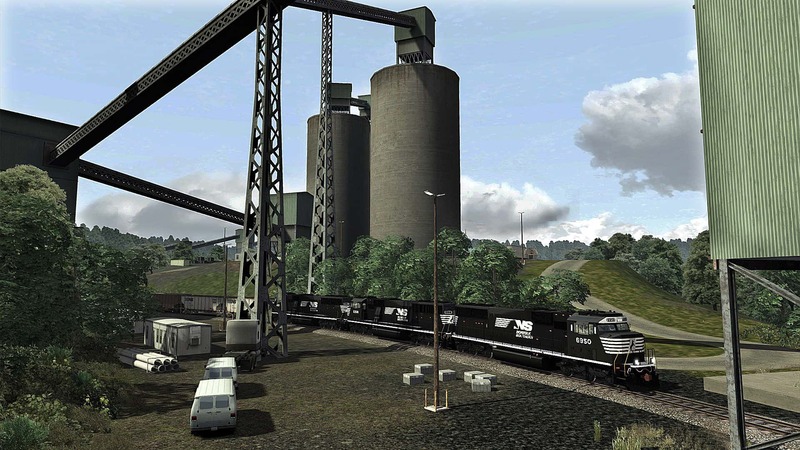 Four scenarios featuring the unique NS SD60E on the Norfolk Southern Coal District route (route available separately) are provided with the new SD60E pack. 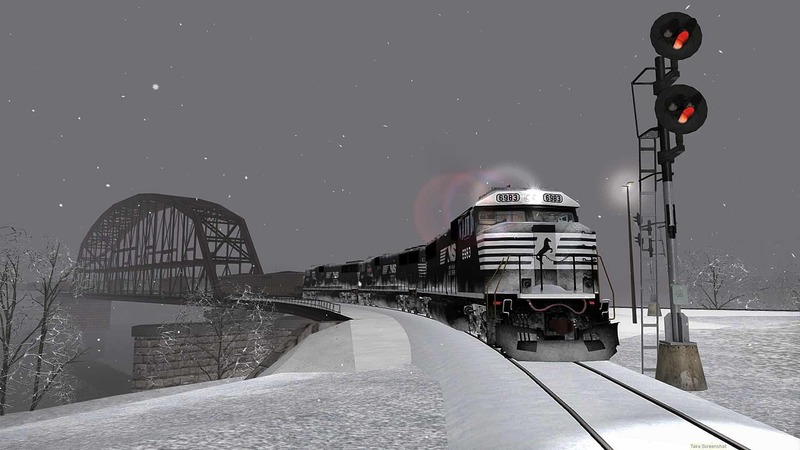 On a snowy eve, Norfolk Southern SD60E 6983 and kin lug coal loads across the Monongahela bridge on the NS Coal District route (above). 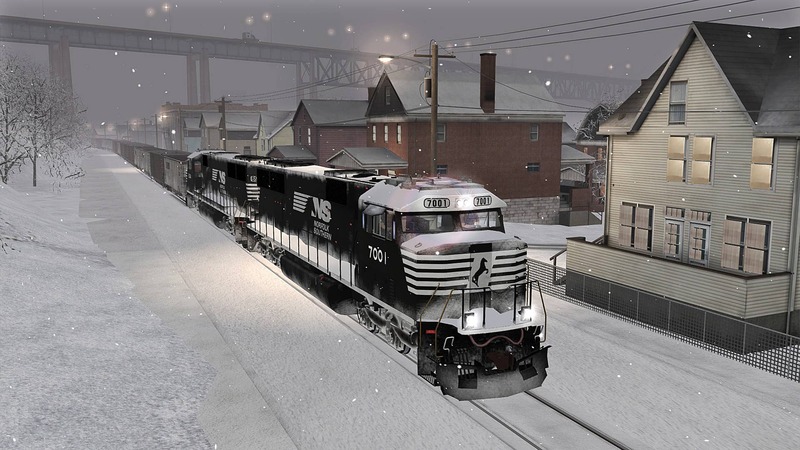 The Train Simulator NS SD60E is dressed in the railroad’s famed “Thoroughbred” livery and is provided in both clean and snow-dressed variants. As an exciting bonus, the Norfolk Southern SD60E pack also include NS’s noted “Top Gon” rebuilt coal gondola (below), several thousand of which were rebuilt by NS from older hoppers beginning in 1991. 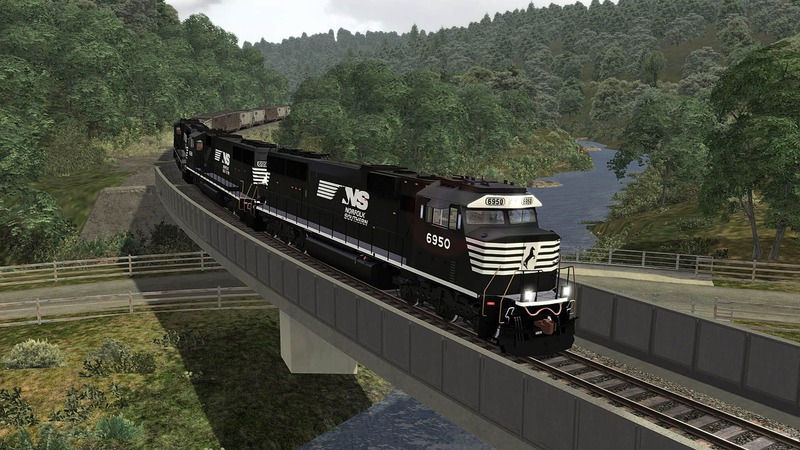 Distinctive, powerful, and enhanced for many more years of heavy, mainline service, the Norfolk Southern SD60E is ready for Train Simulator service - and is now available at the Steam and Dovetail Games Stores!